"The decision to reject the tentative agreement was made by our rank-and-file members who clearly feel they are being asked to sacrifice more than others, particularly in light of the pending expiration of the state's millionaire's tax,” said Ken Brynien, president of the Public Employee Federation. Mr. Brynien should have stopped after the word "others." He is reading tea leaves if he assumes the rejection was over expiration of the millionaire's tax. I think union members, too -- the quiet ones without the signs -- understand that we ALL are Taxed Enough Already in New York State and "taxing the rich" will only drive the well-heeled to permanent safe-haven residences in Florida... and then where will NY be? I can't say for sure why people voted "no" -- they were not asked on their ballot. ... But I note that it was after other unions had approved of their similar contracts that the State announced all the new spending on the "economic development contest." If the state has the money to spend on a contest that pits one region of the state against another, it has enough money to pay people for the 5 days furlough they are being asked to take. It is not as though the workers are really getting out of work . . . the assignments will be higher and deeper when they return. Now it will be interesting to see where Mr. Cuomo cuts. If it is across the board layoffs, then things that need to get done won't -- or at least not on time. Traditionally that is how it has been done to avoid the politically unpalatable task of cutting programs. But cutting programs needs to be where it is done.I will even suggest a program to go: the Regional Greenhouse Gas Initiative and the DEC Office of Climate Change. The program, which cannot save the climate, was implemented by executive order (Gov. Pataki) and won't be missed. The governor could even bill a cut as a jobs plan because it will reduce the cost of electric power for everybody. Of course the "contest" can go as well as all the economic development programs. If people have to be paid to bring jobs to NY, there is still something in NY to be fixed. Good News X 2 . . . We Hope . . .
A couple good stories from 9/27/11. 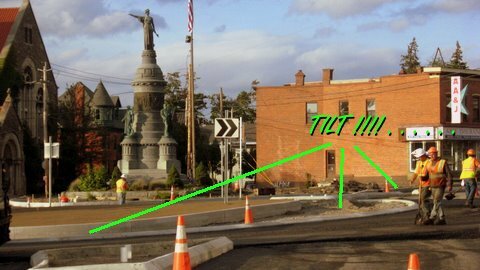 First was the opening of the Roundabout at Oneida Square. While the subject of much ridicule and scorn, after traveling through it Tuesday morning and afternoon from two different directions, it seemed to work smoothly. Much less time was taken to get through the intersection whether from Genesee Street (Yield sign) or Park Ave (Stop Sign) than it took before the make-over. Time will tell whether the narrowing to one lane on Genesee Street will be a problem when traffic is heavy or weather bad . . . But so far so good. Second was the announcement of the 450 new nanotech jobs for Marcy. We've heard such promises before only to be let down . . . but with architectural drawings this time feels like the real deal. Four hundred fifty good paying jobs will be welcome ... but considering that we've lost thousands over many years it is too early to sing "Happy Days Are Hear Again" even if this dream comes true. Troubling is that the State has to practically sell its soul to get private companies to invest in NY. But this seems like a start. Let's keep our fingers crossed ... on both stories. WIBX reported on Congressman Hanna's visit to the Mid-York Library . . .
Hanna who served on the Utica Public Library Board for a number of years says he understands the financial struggle its facing. Hanna said his goal is to lend the full support of his office and listen to what library officials have to say, “It’s an easy place to cut, but the one thing about a Library is that it’s a great leveler. . . . it’s important to remember that education is the one great leveler and has been throughout history, and Libraries educate." I like the congressman's description of education as being the one great leveler. It is true . . . and defines why it is important to maintain our libraries and other educational institutions. During his speech, Hanna seemed to distance himself from the Republican party when addressing cuts to education and other institutions like public libraries. He said, “I’m comfortable being a Republican. I think that I probably find myself distanced a little bit from both parties because they both tend to be run by their extremes. . . But, these are harsh times so it’s important to bring balance . . ."
When asked about the threat of the government shutting down again Hanna said, “I don’t think that’ll happen . . . When you have 30 or 40 people that want to push for their extreme views it’s hard to get through that because you need their votes and sometimes the things you have to do to get them on board aren’t really palatable, generally." Accusing people of being "extreme" is a personal attack intended to marginalize a viewpoint to avoid having to deal with the substance of what is being said. Claiming "balance" while not addressing the issue at hand with an explanation similarly implies that the people being labeled extreme are not worthy of being listened to. While most people recognize the value of education and libraries (and other matters that the Federal Government may have involved itself in) is it "extreme" to question the role of the Federal Government, as opposed to the States, in the endeavor? Is it "extreme" to question the need for its spending? Since we know that the Constitution limits federal powers to certain essential things, is it "extreme" to insist that the Federal Government do the job it was given to do and stay out of things left to other levels of government . . . at least until the Federal Government gets its fiscal house in order? Mr. Hanna takes pride in his "independent voting record" -- as he should. No representative of the people should be a "rubber-stamp" for party elite. Nonetheless, the congressman needs to figure out why he was sent to Washington at this particular point in time. Dismissal of concerns as "extreme" without explanation merely because they happen to collide with one's worldview interferes with the process.
. . . And you thought they were just constructing a Roundabout on Oneida Square. 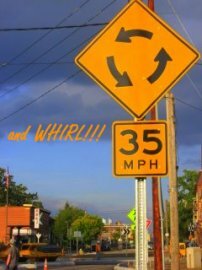 Especially enjoyable will be that feeling of centrifugal force as you speed up from the 30 MPH City speed limit to slingshot around the circle as you go from Genny to State St or Genny to Oneida St. I can't wait. When do the tickets go on sale? The 35MPH signs have been replaced with 15MPH signs. Either someone is reading this blog or someone is on the ball! A funny thought, though, while it lasted. People were just getting used to the idea that the race for Utica mayor would be four-way, when from out of "left" field comes a fifth candidate, Robert Clemente, of the Green Party. Per the OD . . .
During his announcement Tuesday at F.T. Proctor Park, Clemente spoke about various goals for saving the city money, and many ideas had an environmental focus. . . .
“We will think green, live green and save green,” he said. While the "think green, live green" motto will make some see "red," Mr. Clemente's appearance is bringing some new ideas into the mix. One of his main initiatives would be to take over street-lighting from National Grid and build toward medium-scale municipal power generation using methods such as solar panels, he said. Although some may dismiss Mr. Clemente as an academic, is that any less a qualification than iceman (Mayor Dulan), cheese maker (Mayor Caruso), undertaker (Mayors Assaro and Roefaro), teacher (Mayor Lapolla), lawyer (Mayor Pawlinga), or entrepreneur (Mayor Hanna)? We know where they got us. Some of his other goals include listening to the public, bringing pharmacy and food stores to downtown Utica, dealing with sewer and water issues, developing urban forestry and urban agriculture, analyzing whether city services can be delivered in a more efficient way and addressing vacant buildings through deconstruction work and the reuse of materials, he said. These are new subjects for a mayoral candidate to talk about, but they address clear issues that the city faces. Some ideas may be good, other not so, but at least they will be discussed ... and that is the first step to solving Utica's problems. Mr. Clemente's entry on the scene will hopefully get other candidates to present specific ideas for addressing the issues instead of spouting the usual rhetoric. That would be refreshing. Curious Non-Issue . . . There has been a lot of talking about the Marcellus Shale and Hydrofracking ... whether gas recovery is a good thing or a bad thing. It certainly presents an opportunity, but also a threat. It is doubtful that fracking will take place locally, and the controversy here seems a time waster. The boundary of the Marcellus just touches southern Oneida County and it is likely too shallow to be productive. The same can be said of the Utica Shale, which is productive in Ohio, but outcrops (comes to the surface) in . . . Utica, which is where it got its name. (I have a garden full of it!). It really should be a non-issue here. But what IS a non-issue and perhaps should not be is the fact that New York State is one of very few oil and gas producers that has no mineral severance tax. It's hard to believe that there is a tax that NYS does not have, but this is one. While it is doubtful that NYS could fuel state government with such a tax (like Texas or Alaska), it might be worthwhile to consider enough of a tax to pay for the oversight of the industry. Pros and Cons of such a tax should be considered, of course, but it seems that it should be considered now with all the controversy. The State just closed Oneida Correctional Facility to save money. Now it is spending $33 million to expand facilities at Mohawk Correctional Facility (which is next door isn't it?). Employees from Oneida Correctional have been forced to relocate supposedly so the state can save money. Almost ALL state employees are being asked to take 5 days' furlough without pay so the state can save money (even though their work will still be there when they get back because the state refuses to cut programs). If the State has all this money to spend on facilities . . . not to mention the $1 BILLION to be given away in the "economic development" contest . . . why are civil servants expected to take a hit? Interesting News Around the State . . .
"This lawsuit was not filed because of the individual plaintiffs suffering any injury from the program -- but as part of a cause to bring down RGGI in New York," according to legal papers filed last week by Attorney General Eric Schneiderman in state Supreme Court in Albany County. The RGGI program itself was part of a cause . . . Gov Patacki's symbolic attempt at being "green" -- significantly raising our electric rates with no possibility at all of significantly improving the environment. Burns' memo specifically cites a section of state environmental law that says it "supersedes all local laws or ordinances relating to the regulation of the oil, gas and solution mining industries" ... "We do run the potential risk that this law may be litigated," Burns said. Sen. Charles Schumer, concerned that Windstream Corp.'s proposed purchase of PAETEC Holding Corp. has jeopardized plans for a downtown headquarters and local jobs, is asking state and federal regulatory agencies to consider those issues when reviewing the deal. Just what is needed for economic development in NY . . . government interference with business decisions. The state has made little headway toward building a health exchange, but with $38.7 million in grants, New York still leads the nation in receiving money for one. NY sure knows how to spend grants! Yorkville: To Be or Not To Be ? . . . . Isn't that the real question in the controversy over whether or not Yorkville should dissolve its police department? Police protection is probably the most defining municipal service a village can provide to its residents. After the police are gone, what is left? At this point, the only option seriously under consideration is merger of police with the County Sheriff. No doubt, on a personal level, Sheriff Maciol would be able to make this work because he came out of village police ranks, was a village mayor, and knows the territory. However, the County Board of Legislators ultimately will control the budget and the contractual terms will the Village ... the overwhelming majority of whom have no direct interest in what goes on in the Village. What may be favorable terms now for the Village may not be so favorable in the future -- especially when the County understands that it is taking on more risks to go into village policing. Contracting with another entity for this service would seem to always subject village residents to the control of others. If Yorkville truly cannot afford its own police department, perhaps it is time to talk about merger of village government itself with an adjoining village such as New York Mills, Whitesboro, or both. While Yorkville residents' votes would be diluted with those of its neighbors, would things really change for individual residents? I think not. The villages are so similar to each other that they are practically indistinguishable. By merging with other like municipalities, village residents will still be in control. High-end luxury Steuben Glass is closing . . .
Way - to - go N.Y. - not! 116th: Neither of the Above . . .
WKTV ran a "debate" of sorts between Anthony Brindisi and Greg Johnson, the candidates for the 116th Assembly seat that was vacated by RoAnn Destito. Neither appeared particularly engaged or engaging. Mr. Brindisi had his non-specific talking points. Mr. Johnson talked about enhancing Griffiss Airport as our job-maker, but failed to relate this Oneida County-Republican-elite dream to the job of state assemblyman. What I would have liked to have seen is an articulation of how New York State policies harm our area in ways that have not been been broadcast ad nauseum. Forcing people to pay tolls to use Upstate's Thruway "Main Street" does not attract jobs. Maintaining a campus of decrepit buildings and dumping mental patients on the streets of west Utica, does not attract people to the neighborhood. Sending Upstate-generated "cheap" hydropower to well-heeled Downstate does allow Upstate's rates to be competitive for the types of industries Upstate is cut out for. I became a bit hopeful when Carl Paladino endorsed Johnson, figuring that Johnson would exhibit Carl's fighting spirit (which, eg., got the Thruway tolls removed from a section near Buffalo). I did not see that last night, however. Now it appears that voters are faced with choosing between a Democrat ideologue and an Oneida-County-Republican (more parochial than a regular Republican) ideologue. Faced with this choice, logic dictates pulling the lever for Mr. Brindisi. This is not an endorsement of Mr. Brindisi ... but, like RoAnn, being a member of the majority party in the Assembly would give him an advantage in accomplishing something for this district. Articles: How capital crushed labor. Pat Buchannan had a Labor-Day article on World Net: How capital crushed labor . This is a must-read because it describes how trade policy has crushed jobs. This is a must-read for those believing in "free trade." Clipping Wings . . . The race for State Assembly 116th District seems rather quiet. The Brindisi website offers the usual rhetoric on "creating jobs," working for "tax relief," "ensuring strong public schools" and "fixing Albany" -- all phrases calculated to appeal to the disgusted voter -- but with absolutely no specifics offered to indicate that real changes will be made. The one place where Mr. Johnson seems to part ways with the County is to push for a passenger terminal for commercial aviation. There is a shovel ready plan for a 6.3 million dollar terminal at Griffiss. This facility has not been built due to a lack of political courage to move forward with this plan. There is a need for this facility and it can and will be a catalyst for developing new jobs and protecting the jobs we currently have. Although it's not clear how a county terminal ties into a state assembly campaign, Mr. Johnson is at least refreshingly specific in pointing out a need. And he makes sense. As we have painfully learned over the years (and no one in County government admits) anyone looking to locate a major manufacturing facility will not seriously consider coming to an area without commercial air service. However, the dream of a commercial air terminal (which Oneida County had in Whitestown but willingly gave up) may now be beyond reach. Per today's OD Federal money for Griffiss airport may be grounded because another airport in Maine wants a turn at the funds. Congressman Hanna is trying to get a reauthorization, but with the tight federal budget situation more money does not appear likely. Assuming that the funds will be available, would they be well spent? (This blogger has questioned airport spending for years.) Finally, at least one political candidate who, if elected, would be in a position to do something about the situation, is publicly asking what the taxpayers are getting for their dollars. Rodger Potocki, who is running on the Conservative line [for County Executive] . . . said he has been skeptical of the planning process for the airport at Griffiss from the beginning, and if elected would do a cost-benefit analysis of its budget. “The fact that federal funds may be available or not should not drive local decisions." Simply put, federal funds' availability has distorted local decisions ... whether it is Oneida County abandoning an appropriately-sized and well-cared-for airport in Whitestown for a behemoth in Rome, the Utica Master Plan's proposal to require 20% "affordable housing" in all new housing developments in a city already flush with affordable housing, or building a roundabout at Oneida Square that was not on anyone's list of needs. Clipping the wings of those looking for grants will be the first step toward restoring sound decision-making to government.